He's in a family called 'Seabass'. This one is about 45lb. and still not as big as he will be. Taken this morning about 11:00.in 1 meter of depth..
hehe groupers are like the bulldogs of the sea-ugly but cute. that is a scary looking creature! Its really one of the most friendly. Just interested in what you have to feed it. I feed him sardines from my pocket. Watch out for your fingers! He is a champion of a predator in his world , but always friendly to me and other divers. i once offered him my regulator from my mouth as a joke like i would another diver that needed air, ....he took it in his mouth quickly thinking i was offering food. then spit it out . i needed it to breathe so had no alternative but to swap a little spit with him that day. 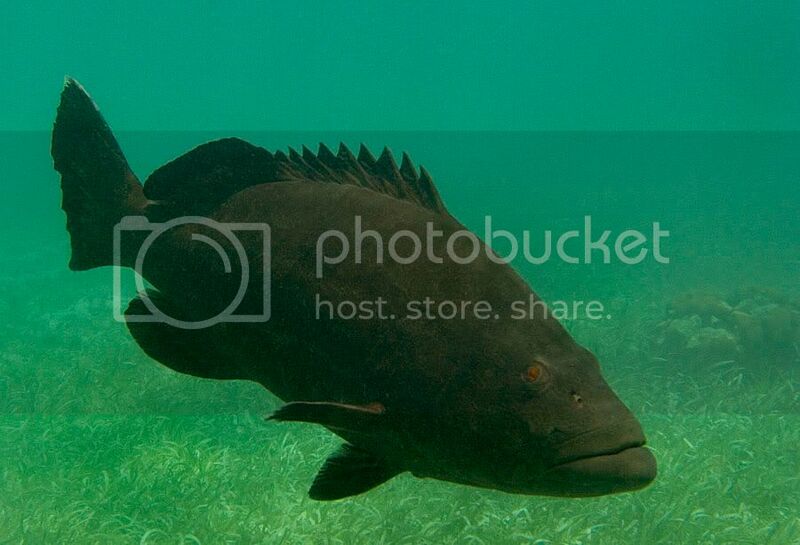 mean-looking fish :-) BTW, I am seriously thinking of visiting Belize. When is the best time? Winter? I like summer. the winter is crowded with tourist. Summer isn't to hot and the seas are calmer. I think the eyes may have cataracts. The camera flash caught them. Yes , but hes such a puppy dog. Looks mean but only wants you to feed him a snack. Over the years hes learned divers have food so he waits under the boat and follows.